Wanted to see a greater focus on preventative measures and saw education as the key enabler, especially in instilling healthy habits from a young age. Emphasised the importance of mental health and wellbeing, and the role of connected communities and good support networks as part of that. Loneliness and social isolation were highlighted by many as an issue for all ages. Participants called for mental health to receive parity of esteem with physical health, similarly shifting the focus to prevention and early intervention, and away from a treatment/crisis model. Highlighted the importance of person-centred care, support to self-manage your health, and of taking a holistic approach to health and wellbeing. Lack of continuity of care is a concern. People want to be actively involved in decision making that concerns their health – or that of loved ones – and have information provided to them in the right way at the right time. Thought that, compared with health care, there is less awareness of the full range of social care services and how they benefit different people – people tend to associate social care with care of older people, when in fact it is there to support a wide range of people in need of support. There was a call for unpaid carers to be treated as equal and expert partners. Information about social care services and entitlements should be accessible and widely available. Emphasised the need for more accessible and flexible services, with increased joined up care and better partnership working. People highlighted the issue of duplication, with the same thing having to be explained to various health and social care professionals at different times. To help people know what services are available in their community, better signposting by professionals is needed. Recognised the current pressures on the system and the need to set priorities for the future. Highlighted the valuable role of the third sector in local communities but also the impact of short-term funding on the sustainability of services. 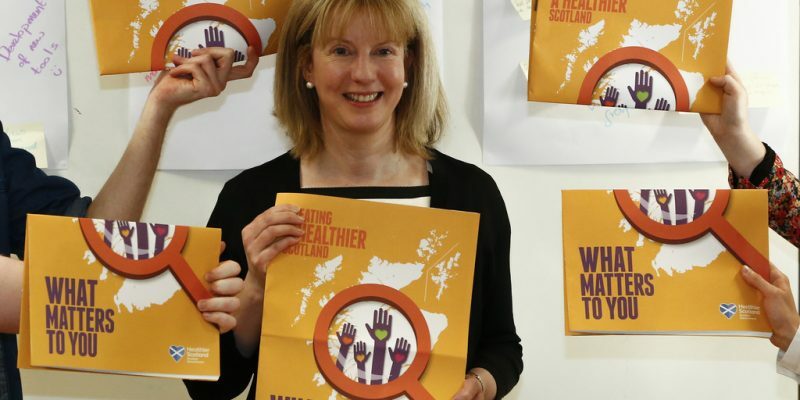 Recognised the need to tackle the underlying causes of ill-health, in order to reduce Scotland’s health inequalities – everyone should have an equal opportunity to be healthy. Supported the Public Health Review’s proposal to develop a Population Health Strategy. Showed a mixed level of awareness of the formal health and social care integration process, but did show support for increasingly joined up and integrated services.